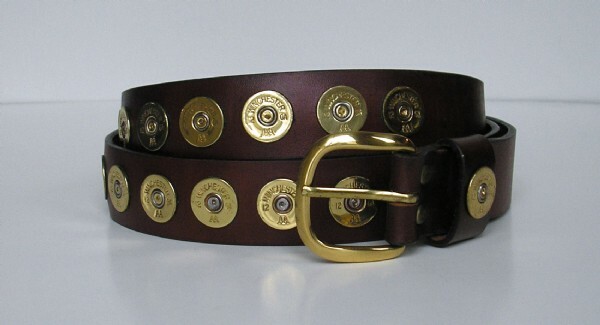 Custom Made Leather Belt with multiple authentic recyled spent WINCHESTER 12 Gauge polished ShotShell Caps around length of Belt + on the Keeper. 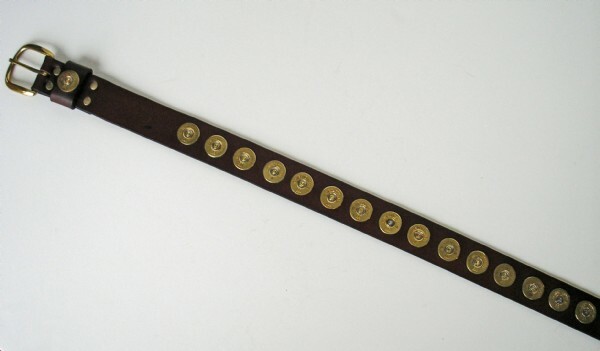 This quality custom belt is symbolic of the serious shooter/sportsman; a trophy belt. The Buckle is Solid Brass Polished and Lacquered. Comes in 1 1/2" inch width, even sizes 30 to 62. Number of Shells increase with size. Leather Color is Deep Mahogany. Made in the USA. Please review our instruction page about sizing as this item is not returnable; or you may call us with any questions at 610-863-9949.